The first yoga sutra is "Atha Yoga Nusashanam." It roughly translates to "Now the discipline of yoga." Life got a little busy (back to school after winter break) AND I got sick (a cold, which I've now passed on to Duff Man) AND my studio is currently closed (boo!) due to construction. I had my first studio staff meeting--which was supposed to include a practice--but the studio wasn't quite ready enough for us to do more than the "business" of the meeting. 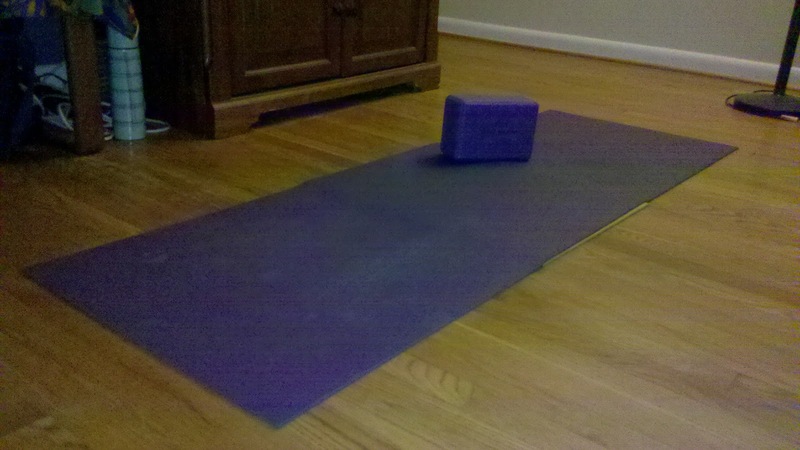 Anyway, I decided that streak needed to end at 7 days so last night I took out my mat and completed my first practice the year--a personal practice in my living room. To have a good balance of stretch and strength. To quiet my mind by focusing on my breath. Table to various motions of the spine (catch/cow, horse, "cement mixer"). Tadasana, utthita tadasana, uttanasana , runner's lunge, anjaneyasana (hold to stretch hip flexor), runner's lunge with flat back/reach forward, skandasana, virabhadrasana II, reverse Warrior, extended side angle, reverse Warrior, virabhadrasana II, ardha chandrasana, virabhadrasana II, reverse Warrior, vinyasa, jump to utthita uttanasana, uttanasana, utthita tadasana, thumbs to heart tadasana. This is the full sequence. I started by only going through part of the sequence, repeating it on the opposite side, then going through it again and adding on a few more poses each time. I have to say that I'm pretty proud I was able to work up a light sweat (especially since my living room isn't as warm as the studio). I was able to bring my focus back to my breath when my mind started to drift. My goal was to practice for approximately 60 minutes. When I came out of savasana, my stop watch said 70 minutes had passed--but really that's because I spend 15 minutes in savasana instead of the 5 I'd planned. That's a good thing, really--I had no idea I'd been in savasana for that long. I'm crossing my fingers that the studio re-opens this coming weekend--but whether it does or not, I'm committing myself to ensuring that I return to a regular practice routine. Even if it means my living room is my yoga studio for the rest of the week.